Hi, hello, how are ya’? I’ve been offline the last few weeks due to a family emergency, but I’m back now. While I was away, the December Release launched and I’ve had these samples sitting on my work desk, waiting to be photographed. Finally had a chance to do that and will be sharing them over the coming days. The hand die cut is mounted onto a Mini Action Wobbler so it bobs around, literally waving hello. LOL! I don’t know how anyone could be uncheered if they received this one in the snail mail! Affiliate Links used wherever possible; if you make a purchase via my links, I receive a small commission from the affiliate provider at no cost to you. Thank you for your support! Love LOVE LOVE all the words. YASSSSS!!! I don’t wanna say I’m obsessed with the Hands Die set , but frankly, I am. If you watch The Story Behind The Stamps , you’ll totally get why. If you missed the measurements for this particular tri-fold, I cut my card stock to 5.5 x 11”, and scored at 3 5/8” from each short end. The “open” end of the dies (where the arms begin), are positioned about 1/8”-1/4” from the score lines, factoring in the slight tilt. I’m still fumbling around with what to call the closure on the hug style card. Interlocking? It kinda does that. And kinda not. Buckle? Sorta buckles… Back in the day—we’re talking eons— I think we called this type of closure a buckle. 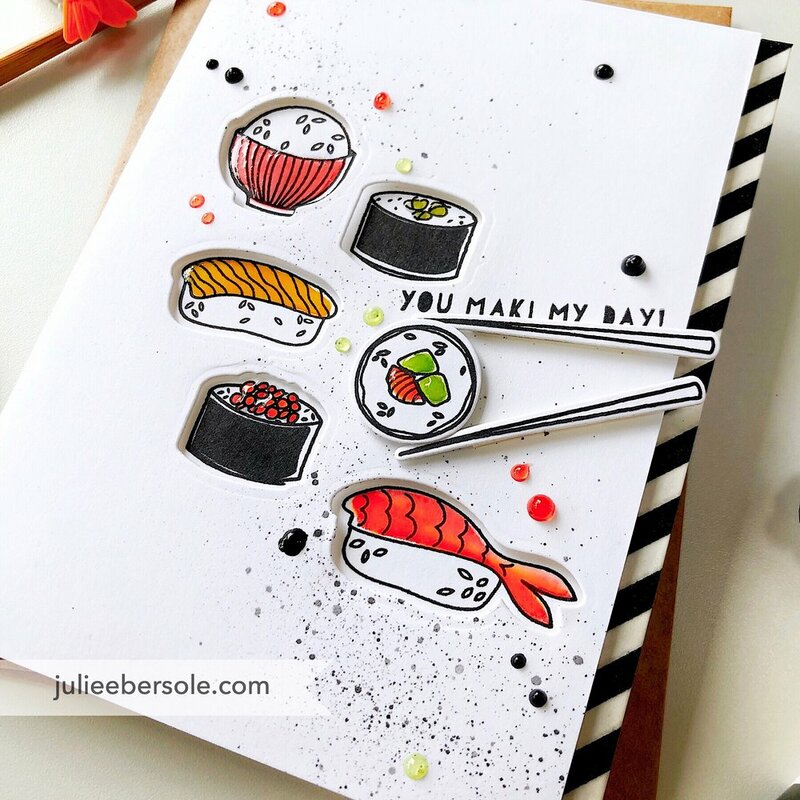 In any event, it’s a fun and easy card to make. And who couldn’t use a hug, even if it’s made from paper? Another variation of the same tri-fold/buckle/tuck-n-fold but with just one of the hands, embellished with some snippets of black and white card stock to resemble a shirt sleeve. Sentiment is from the Hang On Stamp Set. Measurements: 5.5 x 11” card base, score at 3 3/4” from each short side. So… do you have a fondness for the same? *Affiliate links to products included wherever possible; when you shop via my links, I receive a small commission from the affiliate provider at no cost to you—thank you for all your support! TWELVE YEARS!!! Wowzers! Happy Anniversary to my dear friend, Ellen! I still shake my head when I remember how she started and how she has so carefully nurtured her simple dreams to grow to where it is now. Girl’s got a lotta pluck and a heart of gold. I’m so stinkin’ proud of her, and grateful, always, that I get to work with her! YAY!!! Ask me what my favorite Essentials by Ellen set or product is, and I honestly can’t narrow it down to just one, even among the ones I’ve personally designed. Julie refuses! BUT, I will cay the ones that make me smile or laugh always rank really high with me, like Wasabi. Plus, I love sushi fo’h realz; I’m salivating just looking at this thing! LOL! Do you have an EBE favorite? Or a handful of faves? Do tell! It’s fun to hear!!! Affiliate links used wherever possible.